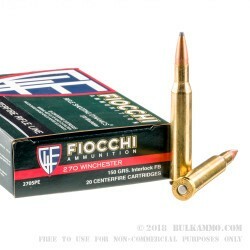 This 270 Win cartridge by Fiocchi Munizioni sports a 150 grain pointed soft point projectile. 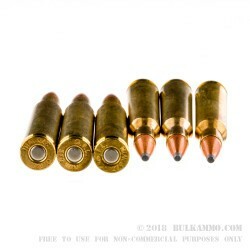 That style of bullet is extremely popular with hunters because its pointed tip gives it better accuracy than your typical rounded soft tip bullet does at long distances, but isn’t quite as fancy as a polymer tipped hollow point bullet like Hornady is well-known for offering. 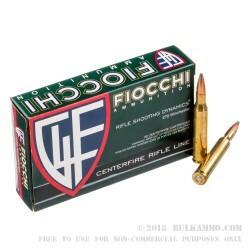 When this bullet hits your target, it will rapidly expand to deliver killing damage. The copper jacket not only helps the bullet to resist deformation while in flight, but also controls the bullet for more precise mushrooming. 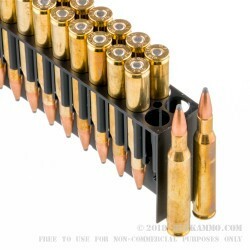 All in all, this kind of bullet is your best friend come deer season.